One of our favorite historic museum ships is in dire need of your help. The whaleback SS Meteor, built in Superior Wisconsin 106 years ago by the well known shipbuilder Alexander McDougall has been a museum ship in her home town since 1971. In 1896 there were nearly 40 of her type afloat, while today she alone represents her whole class. The ship is in generally good condition, in spite of widespread rumors to the contrary, but it needs a great deal of cleaning, painting and routine maintenance. 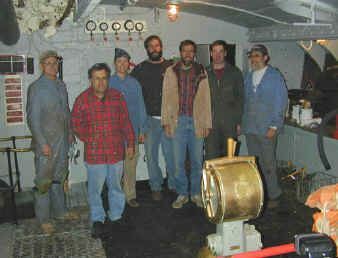 Superior does not have the resources to properly care for the ship, and volunteers are badly needed to undertake some of the necessary tasks. 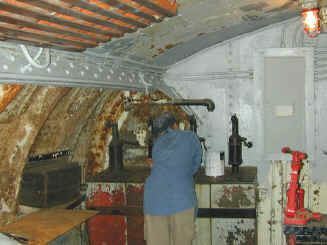 Chipping and painting of deck equipment and engine room spaces are planned and an overhaul of exhibits is scheduled for Spring. 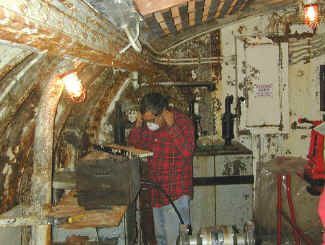 Superior Public Museums is seeking grant money to drydock the ship sometime in the next two to three years to undertake more ambitious hull maintenance work. The goal is to complete that work before the ship reaches its 110th birthday in 2006. WUAA, Wisconsin Underwater Archeological Association, is planning a work weekend on September 27-28 and has invited us to roll up our sleeves to help. Last year, they spent the weekend scraping and painting in the engine room and the results were encouraging. For those of you who want to get involved in some of the activities of the society and haven't been able to get out to help on our boat, this is an great opportunity to get involved in a worthy cause. It is also a chance to really learn a lot about the inside of this unique type of ship. And you don't need any special skills. All you need is to be willing to get a little dirty and exchange some sweat equity for an interesting and fun experience. We have worked with WUAA on other projects including the Pretoria Boiler PIB project and have always had a fun time with them. Details: All of the details have yet to be learned, but currently the plan would be to leave Friday night Sept 26, stay in a historic house near the Meteor (lodging is provided free of charge), work Saturday and Sunday morning, and return Sunday afternoon. More details will be posted as we learn them. Phil Kerber is in charge of the arrangements for GLSPS so call or email him if you are interested. Email is probably the best pkerber@glsps.org but he can also be reached by phone 763.478.3074.